The Smith-Hughes Act of 1917 promoted a new kind of education for many high school of the country. Federal funds, on a matching basis, were to be made available to those high schools that would organize and conduct classes in agriculture over a 12-month period; and, hire a qualified teacher to conduct these classes on a "learn-by-doing" basis. By 1920, one hundred high schools were organized under the provisions of the Smith-Hughes Act and the directives of the Illinois State Board of Vocational Education. As is true of many new educational ventures, numerous individuals questioned their purposes and merits. In the case of vocational agriculture education, much of this reaction was due to a lack of understanding of the new program's objectives and how the program would meet the educational needs of rural high school youth. In the early 1920's, Mr. Carl Colvin, then State Supervisor of Vocational Agriculture, and several vocational agriculture teachers studied these public reactions and misunderstandings. Mr. Colvin appointed a committee, with A.T. Anderson as chair, to explore what could be done to improve the situation and lead to a fuller acceptance of this program. It was the conclusion that a publication was needed to serve the interests of the association and the teachers. As a result, "The Fan Mill" was started. The first issue was dated, October, 1922. C.S. Anderson of Rockford was the first editor. It was suggested that "The Fan Mill" should be published on an irregular basis whenever suitable materials became available. Unfortunately the records of the early discussions and actions leading to the formation of the association were lost. However, the minutes from 1923 on are a matter of record. During the 1922 June Conference, A.T. Anderson was elected the first president of the Association and W.P. Miller, secretary-treasurer. An executive committee was formed, consisting of the officers of the Association and, in addition, three directories, one from each of the three divisions of the state - north, central, and southern. The state was also divided into ten sections with a temporary chairmen appointed for each, Thereafter, the teachers in each section were to elect their own chairman. In the 1923 June Conference, A.T. Anderson was again elected president. W.A. Newlin of Casey, vice president and F.R. Wakeland of Minonk, secretary-treasurer. Additional officers were also elected to serve in an advisory capacity. Northern Illinois, C.S. Anderson of Rockford, Central Illinois, W.L. Gard of Tallula, Southern Illinois, E.P. Henderson of Bridgeport. 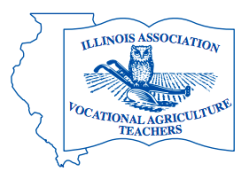 Since 1923, the developing program and activities of the Association are set forth in an excellent publication entitled, "A History of the Illinois Association Vocational Agriculture Teachers, 1922-1970." To establish good relations with high school administrators. To divide the state into logical sections in order to more effectively conduct various types of judging contests. To demonstrate to the Office of the State Superintendent of Public Instruction and the Board of Vocational Education, that a vocational agriculture teachers association could make a real contribution in the promotion of vocational education in the state. To establish and maintain working relationships with the farm advisers and the College of Agriculture. To offset a somewhat prevalent idea that the use of Federal and State Funds in local high school programs would seriously diminish decision-making at the local level.